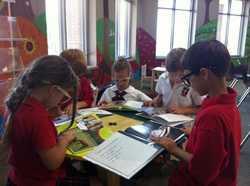 Lower school students explore a variety of subject areas and explore God given talents as weekly enrichment. Our teachers deliver engaging content designed to enhance learning at each grade level. CAMP+ classes extend curriculum beyond the classroom and allow students to grow in their relationship with Jesus Christ. Whether it is through joyful song, creativity in Art, fun and games in PE, opening their minds to a world of imagination in Computers and Library, or engaging the natural curiosity to learn from our past in Latin; CCS students love CAMP+!